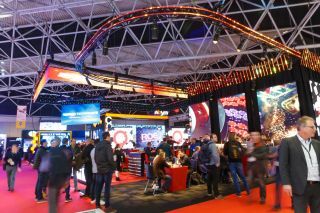 Each year, ISE is home to thousand of pro AV product launches. Here are the digital signage products you need to see at the 2019 show. VITEC’s EZ TV IPTV & Digital Signage Platform enables organizations to centrally manage and stream broadcast-quality IPTV streams and create and distribute eye-catching digital signage and video walls. Exterity’s AvediaPlayer range of media players now includes the m9405 Media Player, which is the final piece of the 4K puzzle for a complete end-to-end, all-Exterity 4K workflow. Key features include 4K Ultra HD video quality, 32GB storage to support hours of media-rich digital signage, a fanless design, and cost-effective Power over Ethernet (PoE). tvONE is launching an enhanced CORIOmaster video wall processor including a secure communication suite with full REST API and multi-user control, as well as a HDMI 4-port output module and a dedicated audio module. Datapath's iolite 12i is a compact wall controller with twelve integrated HDMI outputs, and three 4K DisplayPort outputs - ideal for menu boards and smaller video wall installations requiring a powerful, quiet controller. Navori unveils new rules-based contextual content triggering capabilities within its QL2 digital signage software—offering more flexibility in dynamic content delivery when scheduling. Navori QL2’s new intelligent scheduling and triggering capabilities allow, for example, retailers to base what’s playing on specific screens in stores on inventory levels or deliveries. Designed for presentation rooms, control rooms and complex 4K video distribution across multiple buildings in a campus or workplace. Compatible with all SDVoE Alliance hardware, VuWall's intuitive web interface allows control of systems from any point on the network. BrightSign’s market leading digital signage media players have been updated to deliver BrightSign’s fastest performance to date. The full product family will be demonstrated and shown publicly for the first time at ISE. HyperDeck Studio Mini is a compact, portable broadcast deck ideal for high resolution digital signs with multiple screens, as you can lock and sync the playback of multiple units together. Seamlessly attach any combination of up to four peripherals to the edge of an Elo touchscreen creating a bespoke solution for applications like interactive signage, collaboration, endless aisle and self-service. Navori unveils new rules-based contextual content triggering capabilities within its QL2 digital signage software. These capabilities will offer more flexibility in dynamic content delivery when scheduling. Navori QL2’s new intelligent scheduling and triggering capabilities allow, for example, retailers to base what’s playing on specific screens in stores on inventory levels or deliveries. That means that pre-set “rules” can trigger one-time promotions from linked management systems to announce that new stock has arrived from the distribution center.